Hagrist, Blade's Edge is a unique Hive Knight encountered in the Court of Oryx on the Dreadnaught. He must be killed so that Guardians may use his sword to damage Thalnok. 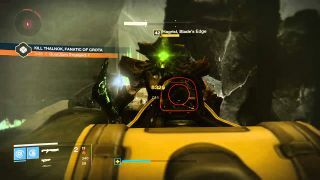 Hagrist is essesntially a remodelled Swordbearer, as, like one, players need to kill him to use his sword to kill Thalnok, Fanatic of Crota as players need a swordbearer's cleaver to kill Crota.